We certify and register all forklift trainers nationally. So talk to us about becoming qualified. Want to become a forklift trainer? Competenz certifies and registers all forklift trainers nationally, and maintains a publicly accessible register of all certified forklift trainers within New Zealand — so if you’re interested, speak to us. We also play a monitoring and support role to all forklift trainers on behalf of WorkSafe NZ, with the aim to maintain and lift safety standards in industry. We review all applications for anyone in industry wanting to become a registered Forklift Trainer to train employees within their own workplace, or to act as an independent trainer and train employees within multiple companies. Competenz does not offer training for Forklift Operators Certificates or ‘train the trainer’ qualifications. How do I register, or renew my current registration? Complete the application form at the end of this section, and supply any documentation that may be required. A Competenz appointed forklift auditor will check your application against the criteria given in the Approved Code of Practice for forklift trainers and operators. View the Code of Practice here. If your application is approved, Competenz will contact you to arrange a mutually agreed time for an on-site audit with a Competenz appointed forklift auditor. Advise you of the recommendation they’ll make to the National Registrar about your capabilities. The National Registrar will complete a final evaluation of your application, and advise in writing whether or not you’ve been successful. Email you a certificate endorsing your registration as a forklift trainer. If your application has not been successful the National Registrar will advise you why this decision has been reached, along with recommended steps you can take to ensure you’re successful next time you apply. For a single, new trainer registration (from one company). Charges for the onsite auditor’s travel and accommodation costs apply (POA). A $50+gst booking fee applies to all travel bookings. Any applicable cancellation costs will also be charged. Competenz has produced resource material packages to support both the training delivery and learning. This saves you the time and expense of creating and maintaining your own quality training resources. Workbooks also help your trainees toward achievement of three Competenz forklift unit standards. Comes with a professionally printed Trainer’s Guide, Assessment Guide, Workbook, and a USB stick with additional support materials. Consists of ONLY the Assessment Guide & Workbook for the candidate. (Must be purchased for every candidate). If you prefer to develop your own learning and assessment material these need to be pre audited and pre moderated by Competenz before they are used. The cost of pre moderation is $75+gst per hour. NB:- Qualifying as a forklift trainer does not automatically allow you to report unit standards. This is the Approved Code of Practice which all registered forklift trainers and operators must adhere to. You can read the ACOP here. What are the 'train the trainer' requirements? Only instructors who have successfully completed a recognised `train the trainer’ course in instructional techniques, will be considered qualified to provide training, assess operators and to issue certificates. The adult education skills sets required are outlined in the forklift ACOP. These skill sets can be evidenced by the following unit standards. 4098 is not a requirement for trainers, only assessors. NB: If you require an ‘F’ endorsement on your driver’s license, the minimum age for this is 18yrs. Do I need to hold a forklift operator certificate to operate a forklift? Yes. The Health and Safety in Employment Act 2002 Section 20 requires all operators of forklifts to be trained in their safe operation. How does the change from Department of Labour to WorkSafe affect training and forklift certification? All forklift operators certificates should be referencing WorkSafe, not OSH or DOL. Programmes should no longer be referencing OSH - the correct terminology is forklift operators training. Can a trainer issue an ‘Operate Under Supervision’ certificate? Under the new H&S Act 2015, section 9 of part 1 outlines the duty of every employer to provide information, supervision and training in uses of plant of any kind. It is recommended new operators have 15 hours supervised practical experience in the workplace prior to attending a forklift operator's course or can return to the trainer at a later date for further training and a resit opportunity. Trainers should not be supplying a certificate indicating that the trainee is able to operate under supervision. It is the responsibility of the employer to ensure that any training procedures are documented. The trainee is authorised by the employer on the basis they have been trained and are competent to operate the forklift. How does the new Health and Safety at Work Act 2015 affect training and forklift certification? The current Forklift Code of Practice still applies. The relevant regulations will be incorporated into the new regulations, under the Plant and Structures legislation, as part of ‘Phase 2’ of the changes which is likely to happen over the next year or two. Current regulations and practices remain in place until these have been reviewed. If you require further details, you can email the forklift registrar here. Can I be trained to operate a forklift if I have had no previous experience? Yes. Most forklift trainers provide good practical lessons in their courses. How can I find a trainer who offers forklift training? A list of registered forklift trainers is available on the right hand side of this page. Can I achieve NZQA unit standards by attending a forklift operator training course? You can if the trainer is registered with an industry training organisation (ITO) to assess unit standards or is an NZQA accredited provider. How long should a forklift operator course take to complete? New operator: This can be up to 2 days. Refresher course: This can be up to 1 day. How long should a practical forklift assessment take? Does an F Endorsement on my driver licence qualify me to operate a forklift in a warehouse? No. The F Endorsement authorises you to drive a forklift on a road. How often must I renew my forklift operator’s certificate? How often must I renew my forklift trainers certificate? Do I need a forklift operator certificate to operate a pedestrian operated forklift? Yes. The ACOP applies to all powered industrial lift trucks. Do I have to be registered with Competenz to deliver a Department of Labour approved forklift operator course? Yes. By engaging with Competenz for the registration process you are ensuring that your course and your own performance has been audited against nationally accepted industry criteria and complies with the ACOP. If my application for forklift trainer registration is not approved am I able to seek a review of the decision? Yes you may apply in writing to the registrar requesting the decision be reviewed. Click here to email registrar. If I leave my job as a forklift trainer and move to another employer can I be employed in the same capacity using my existing forklift trainer registration? No. Your initial registration was awarded on the basis of working for the first employer using course material that was approved for that company. You will need to reapply for registration for the new company and submit course material intended to be used. Where can I find an example of the syllabus to be taught on a forklift operator course? Appendix D of the Department of Labour Approved Code of Practice for forklift trainers and operators. You can read the ACOP here. How often must I attend refresher training? The ACOP states: 'Certificates to be valid for a period of three years, after which instructors should attend a period of refresher training and be re-examined to ensure that they are sufficiently competent to remain registered.’ This guideline is supported by WorkSafe. Please refer to your operator’s certificate for the expiry date. What is the minimum age for a person to be able gain a forklift operators certificate? At least 15yrs. The Health and Safety Act 1995 – section 56 states that no employee under the age of 15 can work with any machinery in a place of work. ii) A lifting machine, a lifting vehicle, a machine whose motive power is wholly or partly generated by the human body and a tractor. Do I need an ‘F’ endorsement on my driver’s license? You will need to apply for an F endorsement on your driver’s license if you will be operating a forklift on a road. There may be some instances where a warehouse environment is classed as a road, if the public can gain access. Please see below the definition of a road. What is the definition of a road? f) All sites at which vehicles may be weighed for the purposes of the act or any other enactment. Is it compulsory to wear a seat belt on a forklift? If a seat belt is fitted then yes you need to wear it. A seat belt must be worn if the forklift is driven on the road. Is a Telehandler classed as a forklift? If the Telehandler has forks attached then yes but there are distinct differences, e.g. load capacity charts which should be covered by the trainer. Forklift operator training courses should use a conventional powered industrial lift truck. Is an Australian forklift operators certificate valid in New Zealand? The employer has sole discretion to accept evidence of an Australian qualification. Individual employers may require additional training or a New Zealand forklift operators certification in accordance with organisation policies and procedures. The position of WorkSafe NZ (formerly Department of Labour) is that where a forklift operator provides a certificate or document that shows that they have received formal training/tuition/instruction/assessment under any of the 7 states and territories of Australia, then NZ employers should recognise this and therefore not preclude the Operator from gaining employment. 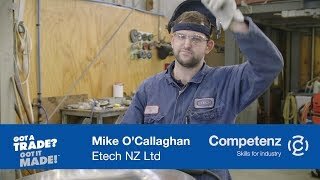 In most cases, WorkSafe NZ agrees that “refresher” training at the earliest opportunity would be sufficient to address any of the differences between NZ and Australia. What is the maximum size of forklift that can be operated? There are no guidelines in terms of classification however Industry has adopted the following in terms of sizes a forklift operator may use. Forklift weighing 18000kg or less (with a load), Class 1 licence and F endorsement. Forklift weighing 18001kg or more (with a load), Class 2 license and F endorsement.